Someday we won't need curtains or blinds on our windows, and we will be able to block out light–or let it in–with just the press of a button. At least that's what Keith Goossen, associate professor of electrical and computer engineering at the University of Delaware, hopes. 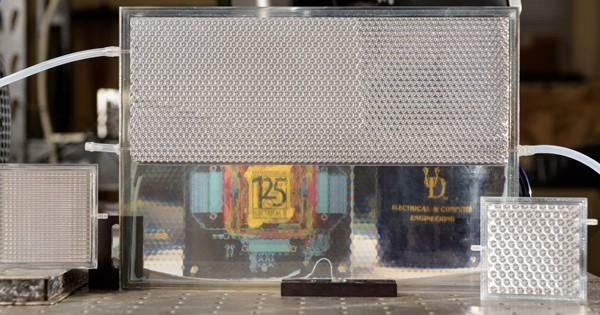 Goossen and Daniel Wolfe, who earned a doctoral degree from UD last year, developed panels that can switch between allowing light in and blocking it out. This "smart glass" technology could be utilized in eco-friendly windows, windshields, roof panes and building envelopes, absorbing light and heat in the winter and reflecting it away in the summer. Although Goossen isn't the first scientist to make smart glass, his team's invention is about one-tenth the price of other versions. It is also more transparent in its transparent state and more reflective in its reflective state than competitors, he said. Then the chamber is filled with a fluid called methyl salicylate–an inexpensive wintergreen extract that happens to be the active ingredient in some over-the-counter pain relief creams. This liquid has optical properties, or interaction with visible light, that match the optical properties of the retroreflective plastic. When combined, the light can pass through, and the system becomes transparent. This is called refractive index matching. Goossen's smart glass system can switch from transparent to reflective a thousand times without degrading, as shown in a paper published late last year in the journal Optics Express. At this week's conference, Goossen revealed a new, improved design. "It performed better than we thought it would based on our theoretical understanding," he said. "There is a lot of interest in the capability this might represent," he said. Commercialization may eventually follow–something Goossen is already well versed in. An author of 82 issued patents, he founded a startup company in 2001 that was later acquired. He passes his knowledge along to students as a co-teacher of High Technology Entrepreneurship, a course for undergraduate and graduate students that focuses on financial, legal, scientific and engineering issues facing tech startups. "Sometimes it's just an instinct about what might be interesting," said Goossen.